190-year-old face: Henry Jones is Australia's first art hotel. Most hotels don't want to show their age, but the Henry Jones Art Hotel happily offers its 190-year-old face to scrutiny, with all its flaws and finery. 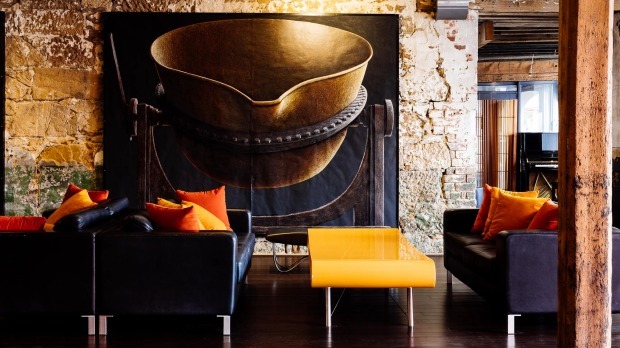 Australia's first art hotel opened in 2004 in a convict-built warehouse on Hobart's waterfront, which had previously housed the IXL jam factory. It recently completed a two-year renovation that has refreshed without detracting from its patina of time: the 56 stylish rooms and suites are garnished with giant TVs and silk-covered beds you won't want to leave, set against sandstone walls scored by convict labourers and weathered, corrugated-iron ceilings. Ever-changing art: Henry Jones Art Hotel. Every room is different, and the cream of the crop are its four suites, including its signature eponymous suite, a showcase for glossy Tasmanian blackwoods. Most of the rooms feature rough-hewn walls and raw, original beams juxtaposed with shiny, white modern bathrooms, all glass and porcelain, with views over the waterfront out to kunanyi/Mt Wellington. The secret of the Henry Jones' youthfulness is its contemporary, ever-changing art: there are more than 400 pieces around the hotel, including entire hallways designed for thoughtful perusal, and works are frequently snapped up from the walls by hotel guests. 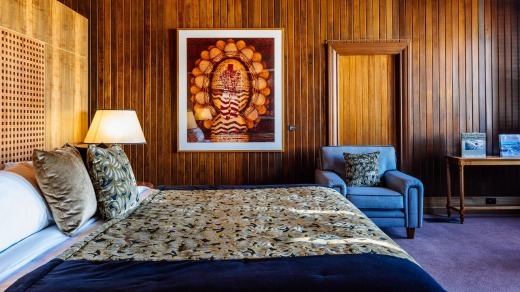 Cleverly, the hotel kick-started its collection by partnering up with its next-door neighbour, the Tasmanian Art School, and has just launched its new $20,000 Art Prize for "early career" Tasmanian artists. The collection is curated by Art Liaison, Emine Lewis, who conducts engaging daily art walks for guests and non-guests. 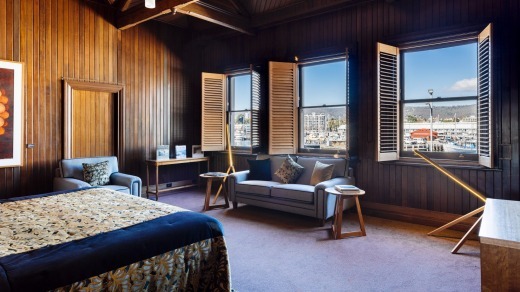 A room with views of Hobart harbour: Henry Jones Art Hotel. Belinda Jackson was a guest of Henry Jones Art Hotel.